The Q Lake is PBF's members-only specimen Carp and Catfish fishing lake stocked with Carp to 37lb and Wels Catfish to 65lb. The unique design of the lake allows anglers to fish from the central island. This design ensures that peg conflict is minimised as anglers are fishing away from each other rather than towards, as found on traditionally-designed lakes. This fishing lake was built is 2008 and has matured very well. In early 2012 over 3,500 trees were planted around the lake as well as on the central island including; oak, beech, rowan, cherry, silver birch, willow, ash and many others and it is an official "Diamond Jubilee Woodland" for the Queen's Anniversary. In June 2010, just over one year after opening, the Q Lake was chosen to hold a qualifying round for the British Carp Angling Championships (BCAC), the most northerly lake ever to do so. Showering facilities are provided for those fishing the Q Lake as well as charging points just in case you need to charge your phone. There are Pizza, Chinese & Indian takeaway services that deliver to the complex. Sunday to Thursday (not including Bank Holidays) - £200 per night. Please note that a 50% non-refundable deposit is to be paid at time of booking. If you are interested in becoming a member of the Q Lake please fill in either of the forms below and e-mail it to info@poolbridge.co.uk along with a photograph or your largest capture. Alternatively you can hand it in to one of the staff or bailiffs. Please note that the membership fee is a one-off payment of £50. The Q Lake is a members-only lake and may only be fished by those with consent. Please purchase tickets either from the café during opening hours, or from the “Honesty Tickets” kiosk, before fishing. Anglers must be in possession of and use appropriate equipment at all times including; minimum 42" landing net, un-hooking mats and/or cradles, carp-treatment kit. Fishing is strictly offered on a ‘catch & release’ policy, with all fish to be carefully returned to the water immediately via a landing net or cradle/mat. Fishing from midday until midday. Please note that your peg must be vacated by midday. Fishing from designated pegs only - No stalking allowed. Please fish within the markers of your swim at all times. Micro-barb hooks only to be used. Braided main line or lead-core must not be used. Main line strength must be a minimum of 10lb. “Fixed Rigs” must not be used – all leads must be capable of detachment. A maximum of 3 rods per angler with anglers holding the required E.A. license(s). Bait-boats may be used but drones are not permitted. Do not damage any of the trees or fauna. No vehicles to be taken on to the island whatsoever. No visitors without prior permission. All litter to be taken away from the fishery. Dogs are allowed on the lakeside if they are well behaved and kept on a lead and under control at all times. Please note the ‘poop n scoop’policy. Visitors to site do so entirely at their own risk and agree that no undue responsibility is given to the Fishery Management for any loss or damage of property or injury to persons. No abusive, disrespectful or derogatory posts on social media or messages to our staff, bailiffs or other Q Lake members will be tolerated. By purchasing a ticket you agree to abide by all the Fishery rules with the understanding that if found to be contravening the rules you will be asked to leave the Fishery immediately without recompense. No trebles and no spinning whatsoever. No Zig foam to be used. Maggots may only be used from October to February. Please remember that these rules have been put in place to protect the welfare of the fish and the fishery and to help ensure that everyone has an enjoyable session. Anyone found breaking any of the above rules will be asked to leave the fishery immediately and their Q Lake membership will be revoked. Please see one of the bailiffs or owners if you have any issues whatsoever or you would like to discuss any of the above rules. Bait boats may be used. Baiting your peg from the outer bank is also allowed as long as appropriate consideration is given to other anglers' swims. A boat is provided to assist in releasing fish stuck in the weed. The provided lifejacket must be used at all times whilst using the boat. Chimeneas are provided to help keep you warm in the colder months. Only logs purchased from the Q Lake log store are to be used please. No fires whatsoever. 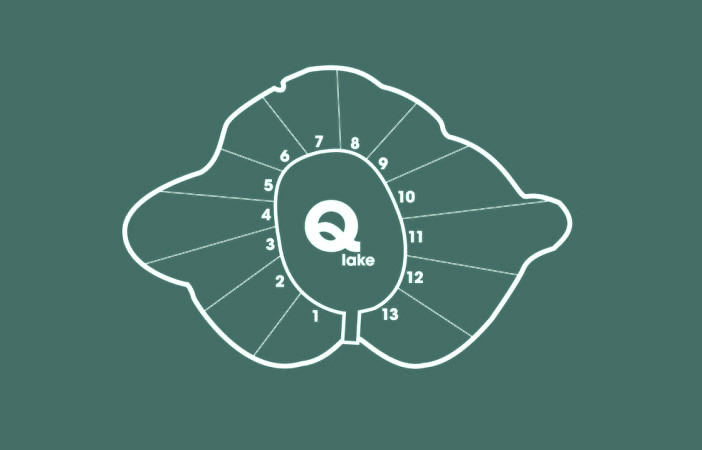 Please quote your Q Lake membership number when booking your peg. Pegs may be booked up to 12 weeks in advance or full-lake bookings more than a year in advance. From March 1st 2019 48 hour weekend (Friday & Saturday night) bookings will be able to be made up to 12 weeks in advance, whereas 24 hour bookings will only be able to be made one week in advance.